Happy Independence Day! As we celebrate the birth of our nation, let’s pray for true independence for every soul: freedom from sin and all those things which keep us from loving God with our whole heart. Below is a beautiful prayer to Our Lady of America, written by Sister Mary Ephrem, a Precious Blood Sister, to whom Our Lady appeared in the 1950s. The apparitions were approved, and actively promoted, by the former Archbishop of Cincinnati, Paul Leibold. Our Lady called all Americans to turn from sin and live lives of purity, so that America could lead the world in purity and peace. We know what you’re thinking – was Our Lady talking about the right country? But with God all things are possible, and where sin abounds, grace abounds all the more. God’s grace is powerful, and when we cooperate with His plan by living in fidelity, there is no miracle He can’t perform. Oh Immaculate Mother, Queen of our country, open our hearts, our homes, and our land to the coming of Jesus, your Divine Son. With Him, reign over us, O heavenly Lady, so pure and so bright with the radiance of God’s light shining in and about you. Be our leader against the powers of evil set upon wresting the world of souls, redeemed at such a great cost by the sufferings of your Son and of yourself, in union with Him, from that same Savior, Who loves us with infinite charity. We gather about you, O chaste and holy Mother, Virgin Immaculate, Patroness of our beloved Land, determined to fight under your banner of holy purity against the wickedness that would make all the world an abyss of evil, without God and without your loving maternal care. 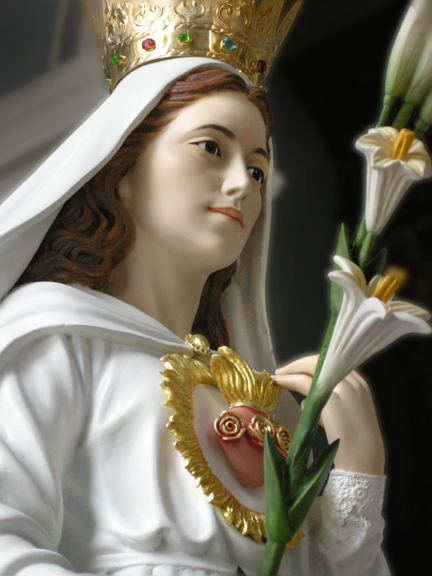 We consecrate our hearts, our homes, our Land to your Most Pure Heart, O great Queen, that the kingdom of your Son, our Redeemer and our God, may be firmly established in us. We ask no special sign of you, sweet Mother, for we believe in your great love for us, and we place in you our entire confidence. We promise to honor you by faith, love, and the purity of our lives according to your desire. Reign over us, then, O Virgin Immaculate, with your Son Jesus Christ. May His Divine Heart and your most chaste Heart be ever enthroned and glorified among us. Use us, your children of America, as your instruments of peace among men and nations. Work your miracles of grace in us, so that we may be a glory to the Blessed Trinity, Who created, redeemed, and sanctifies us. May your valiant spouse, St. Joseph, with the holy Angels and Saints, assist you and us in “renewing the face of the earth.” Then when our work is over, come, Holy Immaculate Mother, and as our Victorious Queen, lead us to the eternal kingdom, where your Son reigns forever as King. Read Sr. Ephrem’s account of the messages of Our Lady, as well as those of Our Lord, St. Joseph, and the Archangels Michael and Gabriel. They are beautiful messages and quite timely, as they speak of God’s desire for us to live in sanctifying grace, and for our families to be holy, modeled on the Holy Family of Nazareth. By thy Holy and Immaculate Conception, O Mary, deliver us from evil. This entry was posted in Devotions, Our Lady and tagged Independence Day, July Fourth, Our Lady of America, purity, Sister Mary Ephrem by texasnuns. Bookmark the permalink.